He added that the industry has dealt with the issue several times in the past. Murthy said he has no doubt that all industry leaders have good intentions to solve the problem of layoffs. "There are a lot of smart leaders in the industry, but I have no doubt at all that they are all well-intentioned people and they can find solutions," he told news channel ET Now. IT companies can protect the jobs of youngsters if senior executives take pay cuts, said Infosys co-founder NR Narayana Murthy. Murthy also said this is not for the first time that the industry has faced the layoff problem and hence there should not be any extreme anxiety as the industry had dealt the issue and found solutions then. "Let us remember we have gone through this several times in the past. We went through that in 2008, in 2001. So, this is nothing new. Therefore, there is no need for us to become extremely anxious. We have had solutions to such problems in the past," he said. Giving example of Infosys on how they tackled the layoff problem, Murthy said the company could protect the jobs of youngsters after executives at senior management level took pay cuts. 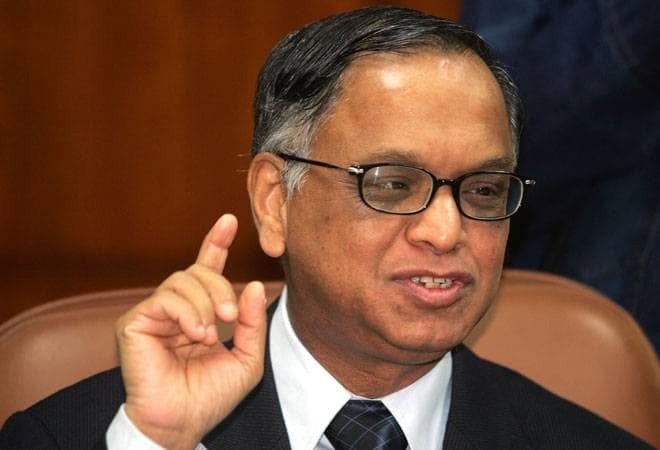 "I have a feeling that it is possible for us to protect the jobs of youngsters if the senior management people were to make some minor adjustments - adjustment of taking salary cuts," Murthy said. The senior-most people at the internal director level took the highest pay cut, and then to follow suit was the senior vice president who took a slightly lower cut, Murthy said. Murthy said Infosys did this in 2001 when the market shrunk. "Let me give you example of Infosys itself. When the market became very tough and it shrank actually in 2001. We all sat together with senior management and then we said -look let us make some sacrifice and ensure that we protect the jobs of youngsters," he said. "That time we had offered jobs to 1,500 engineers. Several companies were postponing the joining day. We said let us not do that, let us demonstrate the commitment to youngsters by senior people taking some salary cuts based on the disposable income as we go down the hierarchy and welcome those 1,500 engineers," he added. Murthy also said parallelly, industry leaders will identify new areas of opportunity and mount training programmes to train youngsters and give them enough opportunities to pick up technologies and ask them to work hard and ensure they are in a position to add value to the company in next one year, and if they failed they could look out for another job. "It is not fair to simply send somebody home, and then let them become very very anxious, because they may have families depending on them. They may have children, parents, spouses and all that, so it is incumbent on leaders of the industry to find reasonable solutions..." he said.